I've dreamed of getting a tattoo for a long, long time. Since I was 18, which makes it TEN WHOLE YEARS. And I still don't have one. It's partly because I haven't been able to afford it and partly because I'm not yet decided. In my life, the three stars would represent me and my two sisters. The three of us live in three different countries, and the tattoo would remind me that we have to stay united. 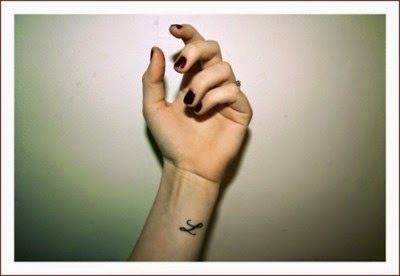 Another idea would be the letter D. On my wrist. ...mine would be a D, not a L, because it would be for David. And no, please don't tell me that we "might break up." Even if we do (highly, highly unlikely: when a girl has the blind, deaf and dumb luck to find Mr Right, she does everything in her power not to let him go! ), these have been the most amazing four years ever. And I will always, always love him. So a sign on my wrist would be a great match with the one in my heart. Mine would be smaller, and there would be less distance between the bird and the cage. 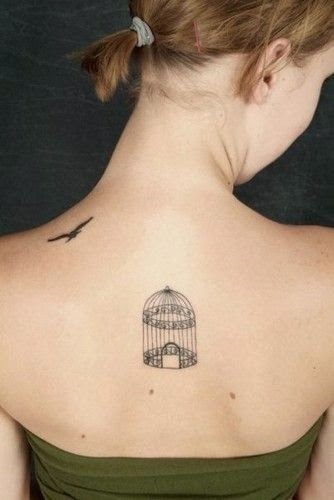 The story behind this, for me, would be a "free as a bird" theme: I'm all about living freely and escaping from the many different traps of life. That's my whole life philosophy. So, at the end of this, I remain undecided. And I suppose that because of that undecided-ness, my skin will remain untouched by needles for a long time. Unless I make up my mind. Or get all three! Gör D först och sen de andra två! I found the 3rd tattoo most original, ité beautiful. In my opinion, I really love the 3rd. But I think that all are small and chic, so, you can also get the 1, the 2nd and the last one. nice to meet you, I'm Anna from Italy :-) nice blog here!! What about following each other? it would be a pleasure having you on my blog!